American beers lose subtlty and class in favour of extremness, why would you want to go there? there are already crass US beers, would crass UK beers make things better? Absolutely, that lack of connection leaves many such breweries with a slightly soulless range where every beer is totally different and equally out of context. Stan Hieronymus, US beer writer, responds. I hold in my hand (when I'm not typing) a mythical beer that no fewer than two people (all right, two people) told me was the best beer they ever tasted. * It is brewed by John Maier and was reputed to be served only at the Rogue Brewery. Impressive, no? These factors have created a mystique around the ale that have both attracted and unnerved me. For months I had this beer in the back of my mind, awaiting me in Newport like a green light across the bay. Before I render my verdict, a comment. Obviously, expectation is a dangerous thing. One's mind can imagine transcendence in a way that one's tongue may be incapable of experiencing. On the other hand, I've had high expectations in rare cases exceeded by experience, which is the double whammy of transcendence--so you never know. As rumors of this beer circulated, I bided my time, nurturing the legend. This is the context into which I sat, regarding my beer, just a half hour ago. As it turns out, you can buy bottles of it at the brewery, which one of these friends did, and it's the one I'm drinking now. Let us proceed in hushed tones, so as not to defile this hallowed moment. The beer in question is Dry-Hopped Red. It's a variation on Saint Rogue Red, draft-only, as the rumors claimed, until a bottling this year. Unlike some of the big reds we've grown used to here in Beervana of late, it is a more modest-sized beer with just 44 IBUs of bitterness (mid-range for Rogue). It has just two hop varieties, and a fairly standard array of Rogue malts. The transcendence comes from the dry-hopping. a point both of the friends emphasized when they were communicating to me which beer to seek: "It's the dry-hopped red, dry-hopped--remember that." Unfortunately, here's the rub. Dry-hopping captures some of the most volatile and delicate oils from the hop cone, and in my experience, they don't age well in a bottle. The compounds react with oxygen, of which there is a small amount in bottles (less per ounce in the twenty-twos, but enough). What is available in the bottle, therefore, isn't what my friends tippled at the coast. It is a tasty beer, and the hops are vivid. But the life isn't here--it's a packaged product and the edges are gone. I would call it a great recipe and a very nice session, but I don't believe this is the beer that begat a legend. You may raise your voices--this is a false alarm. So the mythic beer remains elusive. Somehow, I sort of hope I never find it. We all need a white whale. *I wrote this last night. I don't regularly drink beer for breakfast. As much as it pains me to admit it, the beer that was first to characterize the West Coast style of American brewing was Sierra Nevada's Pale Ale (not, regrettably, something from Oregon). To emphasize this august history, Sierra Nevada offers a robust version for the 27th anniversary of the brewery's founding. This beer (misnamed an IPA on the website) is like Extra Special Pale--everything you love in pale is here but more so! Good stuff. I keep trying to make a swing of mid-Willamette Valley Breweries that I haven't been to, but in the meantime, I did have a pint of the 'Pooya (which seems vaguely obscene). There wasn't anything transcendent about it, but with a creamy body, notes of chocolate, and a touch of nuttiness, it was a fine pint. Need to try more to get a sense of the brewery, but this is a good start. As I alluded to in an earlier post, this proves you can have too much of a good thing. A standard German hefeweizen will be rippling with wonderful flavors, all delicate and breakfast-gentle. Pyramid makes one of the oldest American examples of this style, with perhaps less character than Schneider or Paulaner--but far more than Widmer. So they know what they're doing. However, the intention to imperialize this delicate beer leads one to wonder: what was Pyramid aiming for? What results is approximately what you'd expect. It is cloudy and cider-colored, and fairly glops out of the bottle. The head is nice and thick, but can survive the onslaught of alcohol--and not the only thing. Delicate cloves, tart yeast character, crisp finish; all of these are mugged by the wrenching alcohol. A wee bit of spiciness persists, like a single peppercorn in a winter stew. The beer is thick, alcoholic, and without much character. It's drinkable, but not much more can be said. The inevitability of the experiment seemed clear. So, what was the brewery thinking? 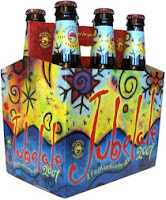 Ten years ago, no brewery in Oregon--possibly on the West Coast--and few in the US could make a decent Belgian ale. Generally a brewer would brew a variation on a regular recipe, deploy a few obvious adjuncts--coriander, candi sugar, bitter orange peel--and call it good. Yeast character--overwhelmingly the most important aspect of a good Belgian--was uniformly ignored. So it is with great enthusiasm that I welcome beers like Vesuvius, a respectable Belgian-style ale. Last year, Vesuvius led the vanguard of Belgian strongs that have lately appeared across the state. (An odd style to crash Beervana's hoppy gates, as it happens. Unlike English strongs, Belgian strongs are approachable and sweetish. Widely appreciated, they are nevertheless not the types of beer you typically find in a Portland pub.) I am slightly reluctant to give an honest review, because Vesuvius is a rare and interesting enough beer that everyone should go buy a bottle. Still, it cannot meet the standard set by Duvel, Delirium Tremens, et al. It looks the part--beautiful spun gold, frothy bead, dense, white head. Softly sweet of palate, with a faintly biscuity maltiness; a slight bubblegum note (phenols), and alcohol warmth drying out in the finish. One criticism: the body is too light; it goes watery just when it should be supporting the heft of the style. Jim Parker's new brewpub, the Green Dragon, is in the midst of a slow opening. The liquor licence is a week or more away, and the beer isn't flowing quite yet. The kitchen is open, and if you want to pop in to see what it will look like, the doors are open. (My guess is that every plate of Belgian-style mussels* you order speeds up the opening, too.) From an email Jim sent out, the beer will be flowing soon: The Green Dragon "should be serving beer, wine and liquor at least in the Bistro space by next week's end." Leave a comment if you've stopped by and have observations. I will do a review at some point, but it's always nice to let a place get up and running and work out the bugs, so maybe I'll do preliminary posts on the beer first. A recent Men's Journal article has been getting some attention for it's apparently careful compilation of a "best of" of world beers. The Hops and Barley Blog is detailing their selections by style in a series of posts, and it's worth a look. One of the reasons I often hate these kinds of things is because they overlook West Coast beers or preference a regional style. Men's Journal has a balanced approach and makes me want to try some of them (Russian River Damnation, Firestone Pale, Stone Smoked Porter). The campaign here is a modern-day separatist movement for a globalized world. This is not a war of guns and guerrillas in jungle hideouts or suicide bombings on city streets. It is a conflict debated daily in the news media, parliaments, cafes, bars and establishment clubs of a country confronting the schisms now facing nearly every European nation: the struggle over national identity following mass immigration from Asia and Africa, the preservation of native culture and language, and economic competition in an era of global markets. Belgium has been without a national government for more than three months now. Two separate stories about hop and barley crops came out this week, and they are something of a brow-furrower. Prices are the highest they’ve ever been - and it’s beyond comprehension. Cascades were priced at $7/lb. three weeks ago and are currently being quoted at or near $10.00/lb. Willamettes went from $5.50 to $7.00/lb. and may also get to $10/lb. It takes three years to get to full production on a new hop field, however, we don’t have the number of growers needed to put new acres in (the total of US growers is about 45, down from more than 2000 in 1978. About new 2,000 acres are going in this year - almost all of those are high alpha. The Cascade increase in acreage is 0. Cascades are, of course, the backbone of Northwest brewing. The upshot is that we'll see increasing experimentation with other varieties of hops as availability drives new recipes. Probably this means greater reliance on high-alpha hops, which may be a downside. The upside may not be all bad, though--it could provoke a new wave of beers. Barley crops aren't under the same kind of pressure, but Laurelwood brewer Chad Kennedy sent out an email alerting us to the trouble brewers may be in as a result of global warming. The brewing and malting research institute in Brno has been exploring the possibilities of utilizing for example chickpea, cowpea or sweatpea for the past year. It is therefore possible that in a few years Czech beer will not be made exclusively from barley malt. Deschutes Brewery is rolling out the barrel and introducing a new traveling pub to share their signature pub culture with the rest of the Pacific Northwest. The custom-made truck-sized wooden barrel was created by renowned Hollywood designer Eddie Paul and will be stopping in Portland before heading north to Seattle as part of its new Neighborhood Hops Traveling Beer Festival. Original Beer Alert: Rogue "Brewer"
In my wanderings up and down the Western third of Oregon, I managed to stop in with a group of politicos at Rogue's restaurant in Newport last night. No luck on the much-recommended Dry-Hopped Red (a mythical beer sighted only in Newport), but I did try Brewer, one of the rare beers I would call truly unique. This is the third batch John Maier has made, but based on descriptions of earlier versions, an interesting departure. Those were based on a doppelbock recipe, and a description of last year's Brewer characterizes it as "a strong ale with tons of hop flavor and a hugh malt backbone." This year's batch is a wild and wonderful mixture of styles. It is as dark as a porter, but quite light-bodied. It is creamy and chocolatey, again, firmly in porter territory. Now the fun: it's vividly hoppy and seemed to be potent (hard to tell amid the competing flavors). I don't know if it was intentional, but this might have been the conversation John Maier had with himself before setting out a recipe: "Cross a brown porter with a stong ale and hop liberally while ensuring that the body stays light and creamy and the subtler flavors of cacao and roasted coffee remain intact after the riveting assault by pounds of hops. The different flavor components should stay intact but complement each other, yet it shouldn't be a challenging beer to drink." 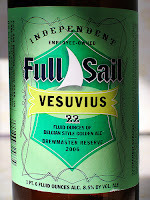 Here's the state of affairs: I have in my fridge two bottles of beer, Full Sail Vesuvius and Pyramid Double Hefeweizen (possibly not the exact name) and not only have I not had time to review them, I haven't even had time to drink them. Nor will I for a few days. I'll be on the road tomorrow and Wednesday, though this isn't necessarily bad news. Over 36 hours, I'll visit Medford, Roseburg, Eugene, Corvallis, Newport, Lincoln City, and Salem. Dunno what kind of time I'll have for beer drinking, but I wouldn't be surprised if some happened. So there could be some interesting non-Portland content in my future. Very cool site I just discovered in which Belgian brewing terms (beer styles, producers) have short pronunciation .wav files in the Flemish and French. Run up against "gueuze" or "oud bruin" and thought it was best just to keep your mouth shut? No longer! Now, in crisp tones, sort of halfway between German and French, you can hear a Belgian say clearly "Owd Brehn." Whether your friends will appreciate your newfound pronunciatory skills (yes, it is a word) is another matter. But you, in your heart of hearts, will know you're right. It's a simple idea. On Sunday, September 30th, at 9:00 PM Eastern, we're raising a glass to Michael Jackson, and raising money in his name for the National Parkinson's Foundation. We hope to have a list up soon of bars and brewpubs that are participating; I know for sure that Monk's Cafe and the Grey Lodge are doing it in Philly. If you are a bar or brewpub owner, and would like to join in, e-mail me and I'll get you the information, and a template we've made for a flyer/poster. There will be other, ongoing opportunities to honor Jackson's name and legacy, but this one, as Sam Calagione said, is from the heart. Here's to Michael. See you on the 30th. Dunno if places in Portland are participating, but you could send Lew an email and find out howw to participate. In any case, mark the toast on your calendar. That's six, Portland time. In other Jackson news, he did a video interview just three weeks before he died that you can watch here. Toward the end, he mentions that he was planning to write a book called I Am Not Drunk about his struggle with Parkinson's. "I know a lot of people were saying it, wondering whether I had a problem or not." In the A&E friday, John Foyston mentioned that Roots had a new saison on tap--a nice way to break a beer fast of a week, my favorite beer style and one of my favorite breweries. Saisons are an artisan style and feature pretty broad variability in ingredients. Some, like Dupont, are purely reinheitsgebot (water, malt, hops, yeast), while others have a variety of botanicals. Roots' versions is the latter, and in a couple of ways, strains the style a bit. But as always, the brewers have gone for a bold interpretation, and what results is tasty and mighty quaffable. From memory, the adjuncts they used were hibiscus blossoms, sweet orange peel, "lemon zest" (your guess is as good as mine), and pink peppercorn. The style is generally spicy and peppery, a quality usually achieved through hops; Roots forsake sharp hopping and draw the flavors out with these adjuncts. The balance was tilted a little heavy toward the floral, and was a little light on the pepper. In other saisons, black peppercorn creates a wonderful earthy note that strikes the palate much like some hops. The finish is dry and crisp, as you'd expect. The downside is the carbonation, which is minimal. Saisons should have a frothy, rocky effervescence that produces a luxurious head and stays lively in the glass. It contributes that characteristic prickliness on the tongue and isn't heavy, despite the strength. I wonder if this is a function of yeast experimentation--possibly it will continue to carbonate in the kegs. It's something you won't find commonly at a brewpub, so stop in for a pint. Where I am going there are no beers or computers, and there I will stay until Saturday. As a result, posting will be nil. A fine opportunity to read that huge Jackson interview. 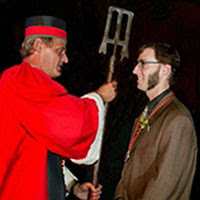 Thiel was recognized for his ongoing contributions to the art of Belgian brewing as practiced at Brewery Ommegang and in the U.S. He has been brewmaster at Brewery Ommegang since its inception in 1997, and has been responsible for the development and ongoing production of the five highly regarded Belgian-style ales the brewery produces. The ceremony in Brussels was presided over by Grand Master Jack Van Antwerpen and attended by the Knighthood of Brewers, as well as Laurent Demuynck, president of Duvel Moortgat USA and Brewery Ommegang. Other Americans inducted were Tom Peters, co-owner of Monk's Café in Philadelphia, Eddie Friedland, owner of Edward I. Friedland distributorship in North Philadelphia; and Joe Lipa of Merchant du Vin Importers. All are credited with helping create rising interest in Belgian beer in the United States. "Inclusion into the Guild is an inspirational and humbling occasion all at once," Thiel said. "The members of the Belgian brewing community take great pride in their unique heritage and current achievements in the international arena. To be in the presence of people I respect so much, sets a higher standard to shoot for. It truly is an honor." This just raises so many wonderful possibilities. First off, I'm scrapping this blog post haste--it's all Belgium all the time from here on out (Beervana, pah!). Second, I'm starting a Belgian beer blog that will feature a lot of words like "post haste." Third, I will begin a Portland society of Belgian-beer knights, and we will parade around the Oregon Brewers Fest in robes that look like tulip glasses of Flemish Red Ale. We will call ourselves the Western Royal Order of the Duchesse. Or perhaps I should just pioneer the Knights of Beervana and then we can selectively knight Belgians and hope for reciprocity (sort of like link-trading among bloggers). It may go nowhere, but the meetings would sure be fun.